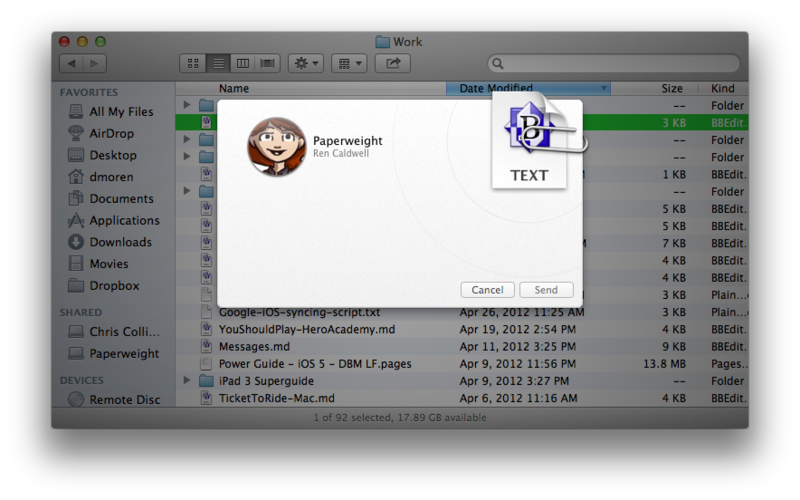 By default, Mountain Lion lets you share through built-in OS X apps like Mail or iMessage. But Sharing is extensible in a couple of different ways. For one thing, you can add accounts in the Mail, Contacts & Calendars preference pane—including those for popular services such as Twitter, Flickr, Vimeo, and (later this year) Facebook—which then become available as options in Share menus. By adding an account there, you ensure that you only have to enter your credentials once, rather than every single time you want to share a file. You can even enter multiple accounts for some services, such as Twitter, and choose the one you want to use on a per-post basis which account you want to use. What happens when you click on that Share button varies depending on what you're sharing and how you're sharing it. For example, if you're posting to Twitter or Facebook, you'll see a sheet on which you can fill in a post to go with whatever you're sharing, along with a button that lets you add a location. When adding photos to Flickr or videos to Vimeo, you'll be able to add a title, description, tags, and set the access levels of the picture or video you're sharing. Apple also provides a handy visual cue to show what files or information you're sharing—it attaches a thumbnail of the content to the sheet, attached with a paperclip graphic. 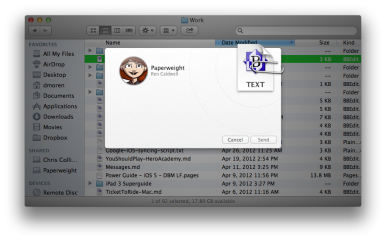 When you share a file from the Finder, you get a confirmation window showing the recipient and the file. When you choose to share something via email, Mail will launch and present you with a mail message, pre-populated with the content you're sharing. If it's a file, it'll be attached to the message, but if it's a webpage from Safari, you'll get a drop down menu in the mail message that lets you choose to share it in Safari Reader view, as a webpage archive, as a PDF, or simply as a link. Certain applications can also add their own Sharing options. For example, in Safari, you can choose to add a page to your Reading List, or to your Bookmarks. The Finder, Preview, and Quick Look also allow you to send a file to AirDrop, the inter-Mac sharing feature introduced in Lion, or to iPhoto or Aperture if it's an image. To that, Photo Booth also adds the ability to set an image as your account picture, or a buddy's picture. Contacts lets you share contact information via Mail, Messages, or AirDrop; the Mac App Store, meanwhile, lets you share info about an app via Twitter or Messages. You don't always have to share items via the Share button, either—the Finder lets you do so by right-clicking on a file and choosing Share from the contextual menu. You can do the same thing in Safari by right-clicking on the location bar. Twitter users can also use Mountain Lion's Sharing features to make posts directly to that service, without need for a third-party client. Just activate Notification Center by two-finger swiping left from the right edge of your trackpad, or by clicking the Notification Center icon in the top right corner of the menu bar. At the top of the list of notifications is an embossed button for Twitter; click it to be presented with a Share sheet for that service. Once Facebook integration is added later this year, you'll also have access to a button that can let you post to that service.